In anticipation and boredom of waiting for the Star Citizen Arena Commander to release next week, I’ve been playing a lot of Diablo 3 when I’m not managing my huge Star Citizen Community Census Poll. 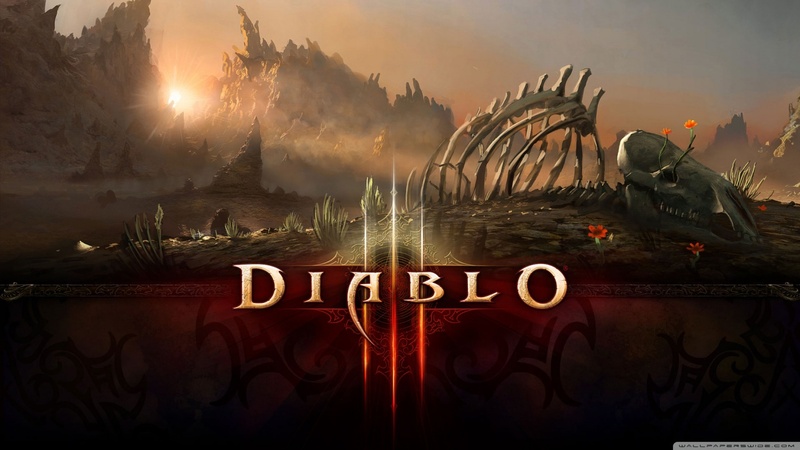 I play Diablo 3 Reaper of Souls during my idle gaming time because it is something that I find I can always come back to. 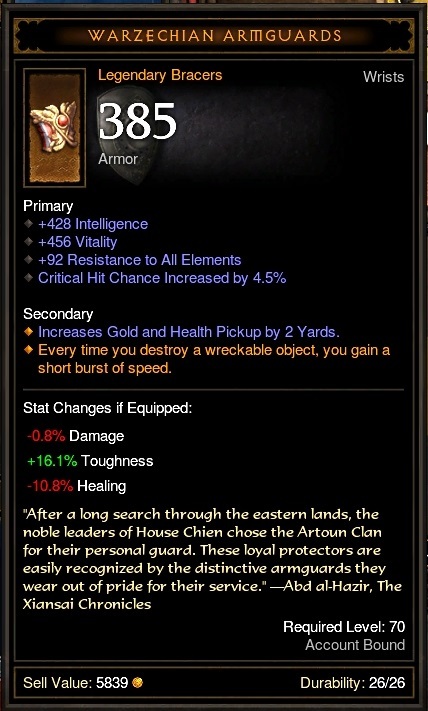 Diablo 3 is an on-going quest for me to continuously find better gear. I now know what the people that binge on World of Warcraft feel like… terrible. My play session last night and this morning were outstanding. 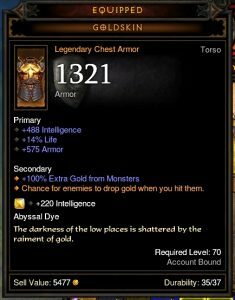 If you were watching my stream, you would have seen the excitement in my face as I found a upgrades and ultimately quite a few legendaries dropped in only 3 hours of total play time – 3 in one dungeon level. 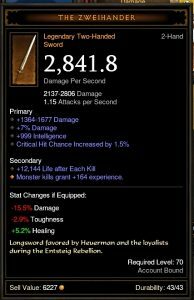 The buff to legendary drop rate for the anniversary buff is sticking, and that’s the official word. 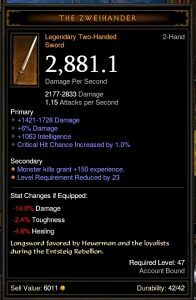 It’s pretty exciting and really makes playing Diablo 3 a lot more rewarding for those that don’t have hours upon hours each day to sink into the game. Needless to say, I’m really enjoying it. In the first 15 minutes of gameplay, two upgrades for my Wizard dropped. I feel like my Wizard has hit a plateau with gear although I know he hasn’t. He only does 6 million damage per second. I’ve seen people do more. I think I need to just get some sets. I’ve also tweaked his build a bit. The big change is going from the Disintegrate Entropy rune to the Chaos Nexus rune. 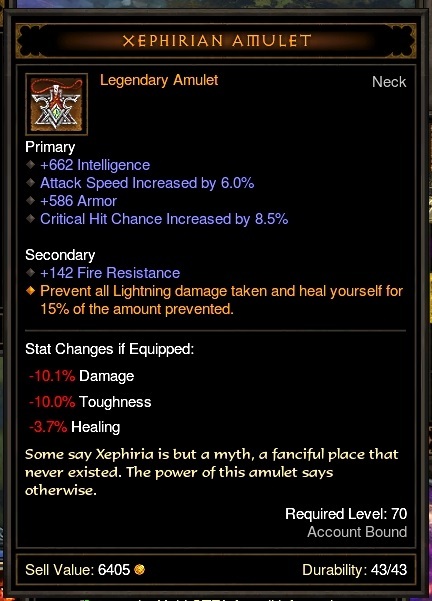 Entropy is great and provides a lot of direct damage, but it really lacks range. Wizards aren’t the hardest of targets so keeping distance from enemies and damaging/killing them before they can put damage on the wizard is ideal. 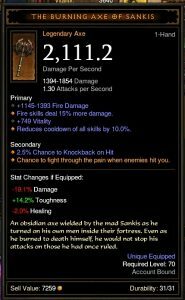 Chaos Nexus offers great damage (511% weapon damage each second to potentially multiple targets). In the past I really thought that entropy was great because it damaged enemies that were spread out. It’s not too common that enemies run at you in a single-file line – if that were the opposite, then I would have used Chaos Nexus from the get-go. But Chaos Nexus has proved itself. The 138% reduction in damage is made up for by more than twice the range of Entropy. The fact that it can also damage nearby enemies in any direction really is what makes up for the lack of width of a damage path (15-20 yards, haven’t nailed down the exact range yet). I’ve also been playing around with different skills for the RMB. I’ve seen a lot of people use a modified version of this build. I keep going back to Arcane Hydra because not only is the extra damage nice to have but the ability to place a secondary source of damage at a different angle than I can provide damage is a huge advantage if you know what you are doing. Ray of Frost – I really liked it with Entropy because it gave me range. With the Cold Blood rune, I could cast it and my Arcane Power would actually recharge. I ended up changing away from it because I could cast either Ray of Frost OR Disintegrate, but not both at the same time. I felt like I could multitask dishing out damage with another skill. Sleet Storm Rune – I gave this a shot. It has a 22 yard range and does 375% weapon damage to anything within that range. I used it as a contingency for when I was surrounded and couldn’t move. I stopped using it because of the same reason as the above… and Entropy was better was killing my way out of a crowd that had blocked me in. Slow Time – I tried a few runs of Slow Time, thinking I could use it to increase damage to enemies or decrease damage taken from enemies or both. It works great that way… when playing in a party with another character that handles crowd control. When playing solo, I found that I was either getting knocked/thrown out of the bubble, too many enemies would come into the bubble and I would have to pull back, or the enemies wouldn’t stay in the bubble. Teleport – I used it primarily for quick traveling, dodging enemies, and as an ejection seat when things got to hairy. 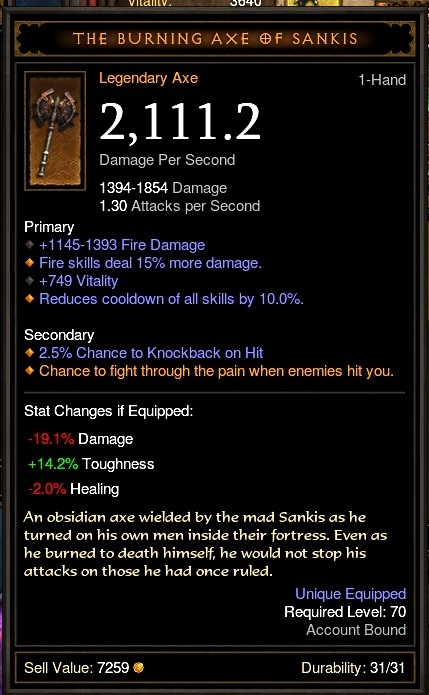 I stopped using it because I felt I could use another skill to apply damage. I’ve been also thinking about removing Archon completely from the build and replacing it with Black Hole or maybe Teleport. I’ve also thought about using Black Hole with the Supermassive rune alongside Slow Time with the Time and Space or Point of No Return runes to act as some powerful crowd control – the idea would be to cast the black hole first and then cast slow time at the same position, further slowing/trapping the enemies caught within. 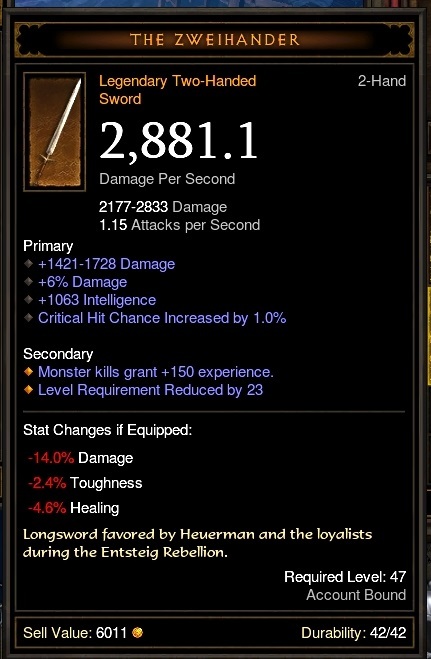 In the first 15 minutes, two legendaries that were upgrades dropped for me. Homing Pads – Pretty awesome for people that have a lot of distractions while gaming due to the unique effect: Your Town Portal is no longer interrupted by taking damage. 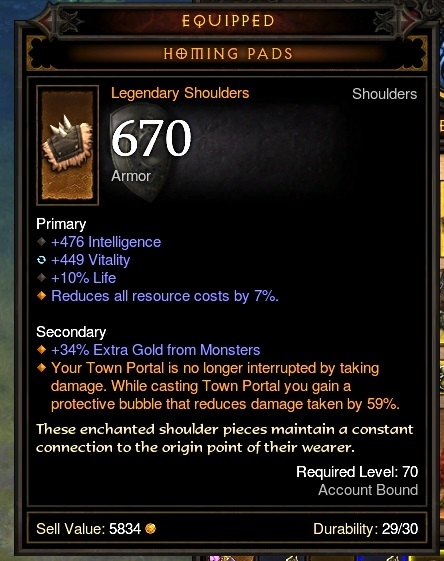 While casting Town Portal you gain a protective bubble that reduces damage taken by 59%. It should be noted that effects like Knockback will interrupt casting Town Portal, even will Homing Pads equipped. 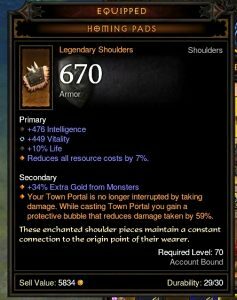 I had to enchant to get added Vitality to make these a complete upgrade for my Wizard, but coming from a level 66 set of shoulders made it easy to top what I had. 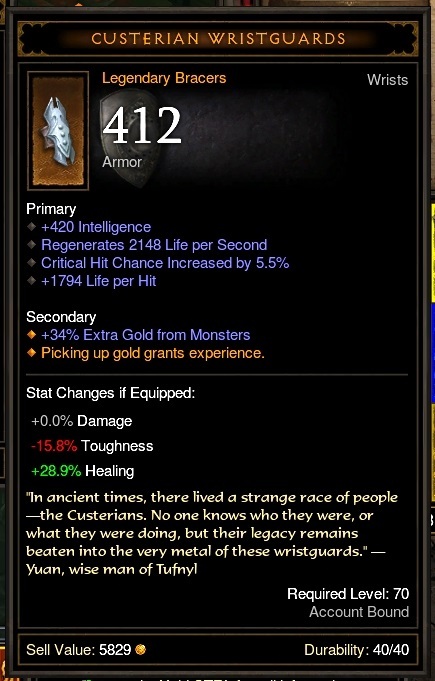 Custerian Wristguards – I was feeling a bit uneasy about putting Tal Rasha’s chest in my stash until this dropped. 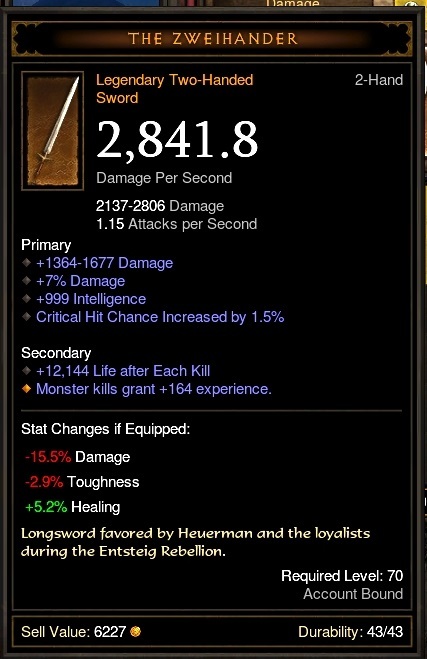 I was able to enchant the life on hit to +armor to balance it out and make it an upgrade to healing with no change elsewhere. With 1511% gold find, I’m not only raking in the gold but also raking in experience. I’m going to have a hard time parting with these for a while. One can never have enough experience. 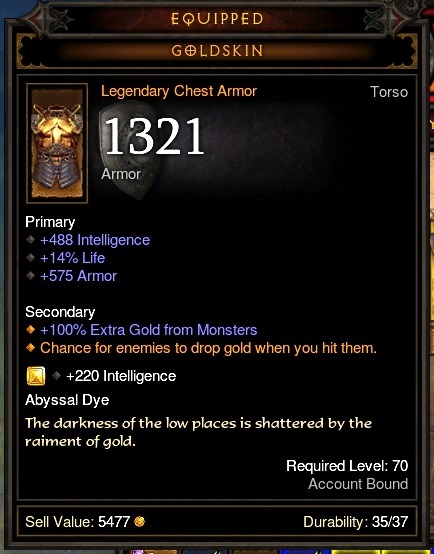 Some other less-notable legendary drops.